13)I want to create a report output in 10 languages, do I have to create 10 layout templates? 14)What is the required installation for using BI Pub report? 15)How do you move your layout or data template across instances? 16)What is the tool to map required data output and layout templates so that they can be tested in local machine? 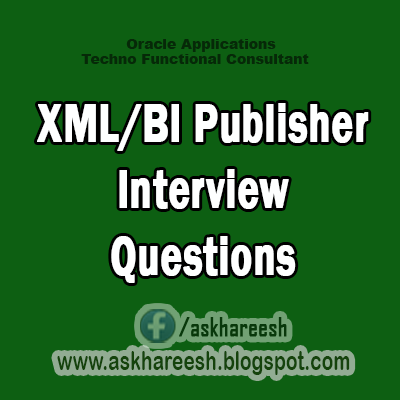 17)Which component is responsible for generating the output in xml format before applying it to layout template? 18)Can BI publisher reports be used in OAF pages? 19)Name some business use cases for BI reports? 20)How do you pass parameters to your report? 21)What are the various sections in the data template? 22)What does lexical section contain? 23)What triggers are supported in Data template? 24)Where is the trigger code written? 25)What is the file supporting the translation for a layout template? 26)How do you display the company logo on the report output? Copy and paste the logo (.gif. or any format) on the header section of .rtf file . Ensure you resize per the company standards.